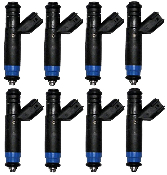 This is a high performance, high volume fuel injector. The fuel delivery is from a single-hole disc. Narrow cone-shape spray pattern. Excellent fuel atomization from very tiny droplet. This is an excellent Siemens fuel injector. Factory-guaranteed flow-matched to within 2%.